Blood drawn from Pope John Paul II prior to his death and saved in case there was need of a transfusion at a local hospital, will be presented to Pope Benedict XVI at the May 1st Mass at which John Paul will be declared a “blessed.” The blood relic will be kept with other relics at the Apostolic Household. Read the entire story here. The great communicator and soon to be beatified Pope John Paul II now has YouTube and Facebook pages. Technology is the friend of a saint and a Church. Headline Bistro is collecting testimony on the ways in which Pope John Paul II has been influential in our lives. The so-called “JPII Generation” is a powerfully impacted by the life, ministry and teaching of this giant of Catholicism. If you can form your response tightly, the Headline Bistro folks are looking for 500 words on why you are thankful to Pope John Paul II. Pope John Paul II will be beatified on 1 May 2011. 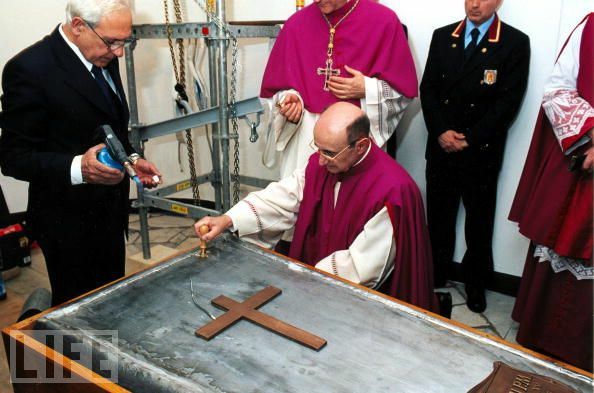 The Holy See is allowing the coffin of Pope John Paul II to be viewed following the May 1st beatification ceremony which will be celebrated by Pope Benedict XVI. After the viewing the papal body will repose in the Chapel of San Lorenzo in the Basilica of Saint Peter. The video story is here. clear from the outset, no tickets are required.